Today we will discuss about difference between up millingand down milling. The milling is a machining process in which, a rotary cutter iused to remove the material from work piece in the direction perpendicular t the axis of rotation. The milling process is done by the machine, which hold bot the tool and work piece in jig and fixture, known as milling machine. There are two ways to cut the material from the work piece through milling machine. First one is named as conventional milling or Up milling and the other one known as climb milling or down milling. The main and basic difference between up milling and down milling is the direction of rotation of cutter to the feed. The milling operation is used to facing of those work piece, which are not symmetrical from its axis. It is also used to cut pockets, drill, slot and shape the work piece according to the requirement. There are two ways to cut the material from the work piece through milling machine. First one is named as conventional milling or Up milling and the other one known as climb milling or down milling. The main and basic difference between up milling and down milling is the direction of rotation of cutter to the feed. In up milling the cutter is rotate clockwise when cutting the work piece from right to left. In this type of milling the tool spins against the direction of feed. In this milling process, the cutting chips are carried upward by the tool. In down milling, the cutter rotates clockwise while cutting the work piece from left to right. In this milling operation, the tool spins with the direction of feed. The cutting chips are carried downward by the tool. In up milling the cutter rotates against direction of feed. 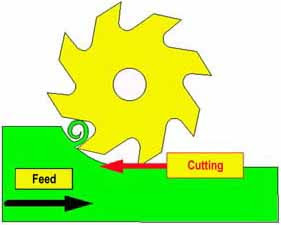 In Down milling, the cutter rotates with direction of feed. It is also known as conventional milling. It is also known as climb milling. with feed. It is maximum at the end of feed. and decrease with the feed. It is zero at the end of feed. causes the change in metal properties. change the work piece properties. 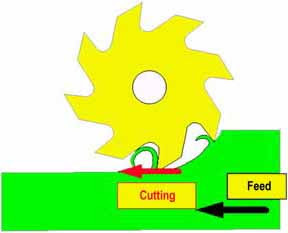 to the cutter rotate with the feed. which again cut the chips cause less surface finish. required to hold the work piece. It is the traditional way of cutting the work piece. diffuse in the work piece. so simple cutting fluid is required. It required high cutting force compare to down milling. It required low cutting force. Today we have learnt about difference between up milling and down milling. If you have any query or doubt, ask by commenting below. If you like this article, don’t forget to share it on social networks. Subscribe our website for more informative articles. Thanks for reading it. ← What is Transmission in a Car? Very easy and helpful explanation. Constitent parallel size may be mountained partially on that parts. It requires upto 20% less power to cut by up milling method or process. In which case do we use up milling and in which case down milling? Which is the high friction in up milling or down milling?